Vicki was great at explaining what the school needed, but she also introduced us to the teachers and children so we could directly hear and see their needs. They needed more classroom space, and they needed more rooms for families to come in and observe their kids and for teachers to have some quiet areas for themselves. We were working with very little money and very little square footage, but we wanted to turn their existing trailers into more than just trailers. We did the usual functional programming—figuring out layouts and where best to place outlets and doors, but more important, we worked on a solution to one main necessity that we identified from our time with the students: The kids need to interact with each other. 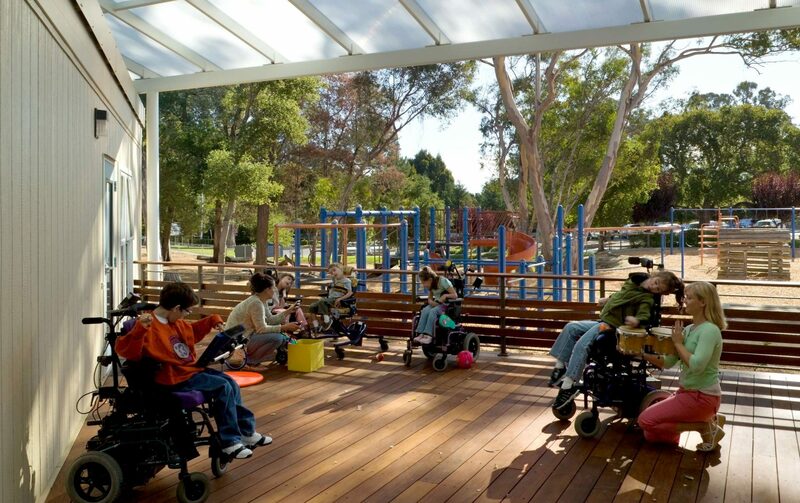 The idea of creating a connecting deck, and outdoor classroom, came from that understanding. 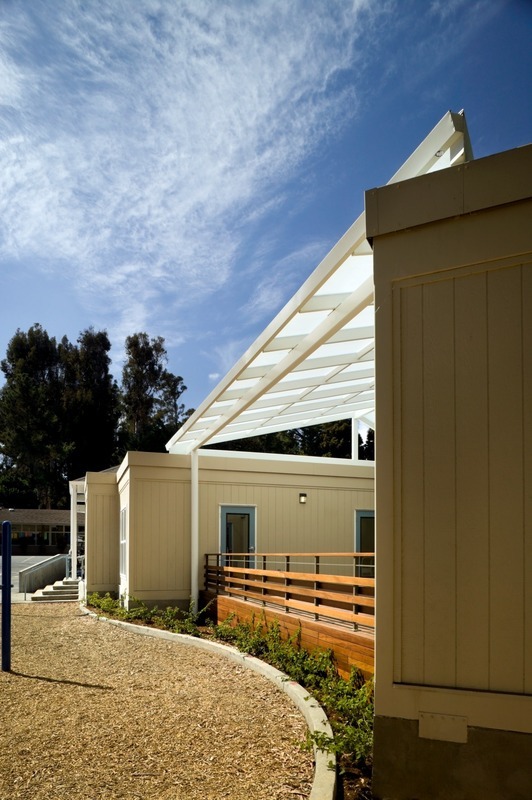 It makes the space an area where the kids can truly be outside instead of it simply being the space between two trailers. 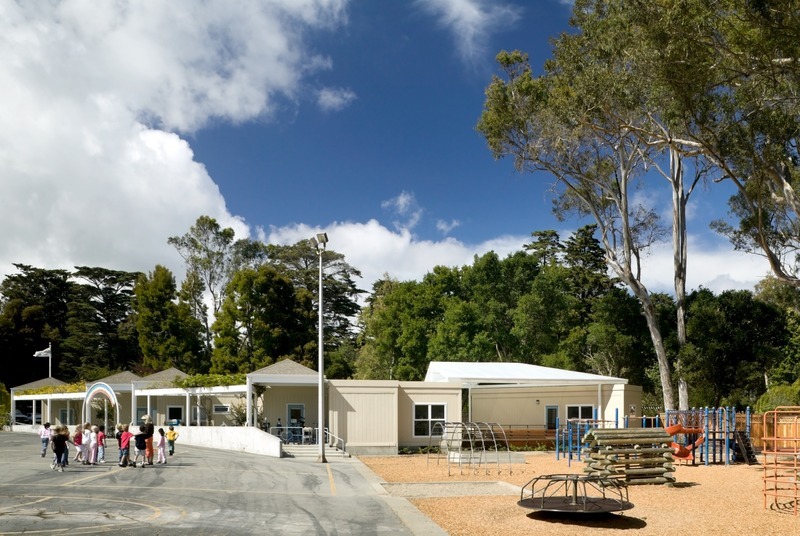 Designing schools, as we often do, we are used to very modest materials, but we also had to shed any preconceptions of what a trailer or a modular building is. We talked to the trailer manufacturers to try to push them to think differently, to really engage in the manufacturing process and not just assemble the components and fix them to the deck. It might be funny for folks to hear that we did three dimensional modeling and tested materials just to assemble some trailers and a deck, but we tried hard to think about every aspect of the teaching environments and indoor/outdoor space. We tackled it with all the energy we would use on one of our fee-generating projects. The final design developed from the usual balance of cost, schedule, and program. 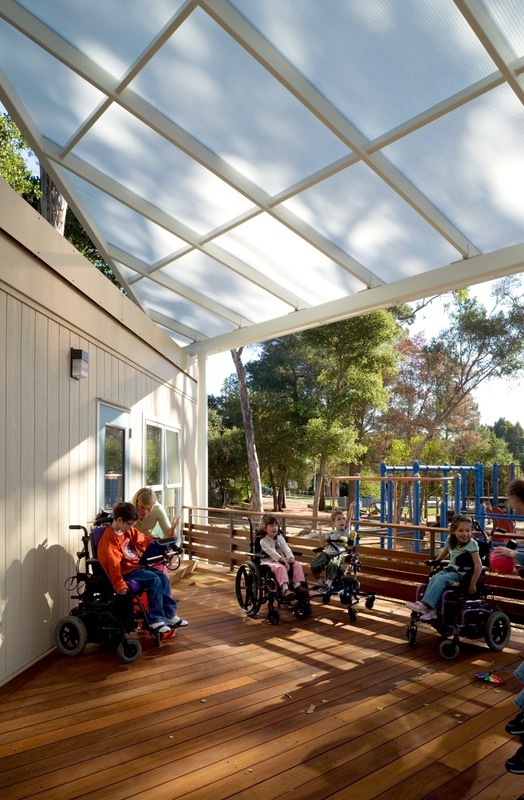 We placed a canopy over the deck to protect the kids from the sun and rain. We fit in a space at the end of the sequence of trailers that connected to what we call “the jungle” at the public school. 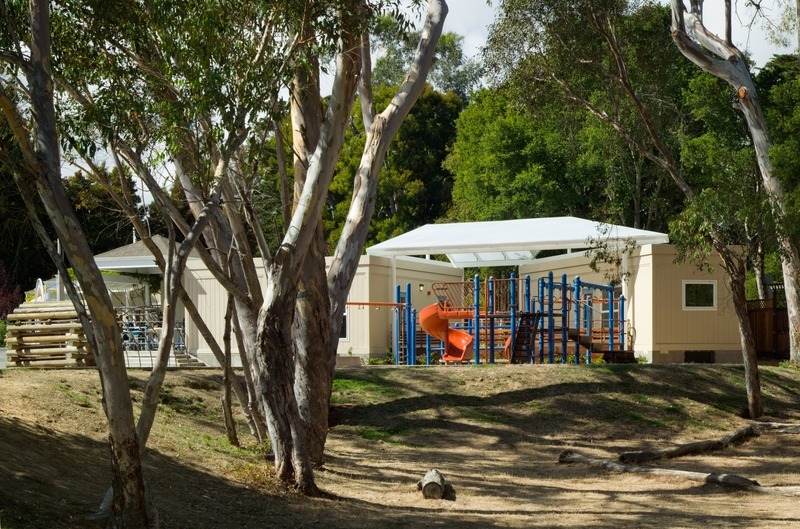 It is a grove of eucalyptus trees and playground structures where all the kids go to play. By connecting the jungle, a place with a lot of significance for students from both schools, to the Bridge School’s outdoor space, we really bridged the gap between the two student bodies. This project took place very early in WRNS’s lifetime as a firm. We were literally just unpacking the boxes in our office, and we had fewer jobs, so we were able to give the Bridge School a good amount of attention. It was also an opportunity to give our younger staff more experience. All of the engineering and some of the contracting were also done pro bono. I didn’t even have to give the hard sell to those contributors; I just presented it as an opportunity, and everyone said, “Absolutely, I want in.” We even talked as a group about making the building as sustainable as possible. Each of those firms had a different reason for wanting to participate. Either people had members of their families with similar disabilities, or they had a history of teaching, or that spirit was just a part of who they are. I was surprised, on such a small project, to find so many people who wanted to help. I think the project pushed some of our senior designers to think differently, too. We didn’t expect that it could be done so simply. It’s important to give credit to structures that aren’t necessarily made of the most exotic materials or creating with the most state-of-the-art assembly techniques. This has been such a worthy job that I think we all feel changed by it. The Bridge School is a nonprofit school of children with severe physical impairments and complex communication needs. Our children generally require assistance to walk, and speech is not their primary mode of communication. Kids come here, and we work intensively with them to develop the reading and writing process from scratch. Once they have an effective way to communicate with others, they leave the Bridge School and go back to their own schools. We have a strong research program to gather and analyze evidence from our practices, and it used to be housed in a separate facility from the school. When I took over as director, I wanted to bring the education and research programs together on the same campus. There were other problems with our existing building. I wanted to expand to have more instructional space, because our children need an environment that is accessible and geared toward their developmental levels. To address our challenges, we enlisted the architects at WRNS Studio. Everyone at the school was involved in talking to them, but our teaching staff had lots of input since they know exactly what they need in the classroom. The team from WRNS also came down to the school to meet the children and see how they move around. The architects came up with some really simple solutions—things that may not sound fancy but that accomplish all of our goals. Our new space is a truly instructional environment, and we use it to maximize the potential of these children. Before, it took lots of time to break down a space or transition from one activity to another, which was problematic because we have several students who are highly distractible. With the new renovations, we are able to separate parts of the room, and the children can get to work with minimal disruption. The kids love the new space! Their favorite part is the deck. They can go out there and just be outside, and it also gives the kids direct access to a beautiful garden the parents planted. Having a nice facility allows us to show others what we’re doing, and it makes us take even greater pride in our work. Neil Young is one of our founding board members, and he is very particular about how things look and work. We didn’t want to look like we’re a special education school, and WRNS took on that challenge. The architects were able to grasp the whole concept, vision, and mission of our school without difficulty. They signed on immediately and brought great ideas. Not only did they provide all the services that the firm offers but, Pauline Souza, in particular, was also phenomenal in getting everyone else involved—engineers, surveyors, and contractors—to donate their services. Only because of WRNS’s involvement were we able to afford this expansion. The team at WRNS didn’t see our children’s limitations; they saw their potential. I think that was part of their dedication—to ensure we had a facility that would help achieve our goal of maximizing that potential of these children. It is a rare insight, and more than anything, we are grateful for that sense of humanity.